Below is a list of articles relating to issues surrounding the Physician Payments Sunshine Act. To keep doctors current on medical issues, drug makers help pay for continuing education. Until now, though, industry has not had to report the value of these sessions to a federal database created in response to mounting concerns that such payments may unduly influence medical research or practice. Interesting article about charities and their role in drug prices and tax payer contributions to medicare coverage. BELLINGHAM, Wash., Feb. 23, 2016 /PRNewswire/ -- Sunshine Act Software announces the public release of its groundbreaking master data management tool for annual compliance reports submitted to the Centers for Medicare & Medicaid Services (CMS) Open Payments program. The Centers for Medicare & Medicaid Services (CMS) announced today that it had released an improved Open Payments website. The website has been enhanced with a homepage tool for searching by doctor name, a “snapshot” of Open Payment data, and additional sections to explore and download data. A recent study by researchers at University of California, San Diego School of Medicine analyzed this database and compared payments among different specialties and identified which ones topped the list. The study was published online the week of January 4 by Mayo Clinic Proceedings. Researchers scrutinized 2.4 million physician payments totaling $475 million made during the last five months of 2013. In an ideal world, doctors avoid outside influence and commit to ethical practice. However, they are also huge influencers in a for-profit pharmaceutical industry. This creates a breeding ground for potential conflicts of interest. The Centers for Medicare & Medicaid Services (CMS) will be publishing a refresh of the Open Payments data reported to CMS in 2015 and 2014 in January 2016. In preparation for the refresh, applicable manufacturers and group purchasing organizations (GPOs) have until Sunday, November 15, 2015, to make corrections to any undisputed records and to remove any previous requests for delay in publication. Corrections to records in response to active disputes can continue to be made through December 31 to be included in the January data publication. * Changes to non-disputed payment records made on or before November 15 will be eligible for publication. * Payment records with any active disputes that remain unresolved as of December 31, 2015, will display as disputed. * Payment records deleted before December 31, 2015, will be removed from publication. * Payment records deleted after December 31, 2015, will NOT be removed from publication. * Payment records that were disputed and resolved as of December 31, 2015, will display as not disputed. Note: Any resolved payment records that result in a change to the covered recipient, and any records submitted to the Open Payments system for the first time after the close of the Program Year 2014 submission window will NOT be published in the January data refresh. These payment records will become eligible in a future data publication. Payment records that were submitted on-time (before the end of the submission window), and were available for review and dispute, are eligible for publication in January 2016. Payment records reported after the close of the submission window are considered late. These payment records were not available for review and dispute, and consequently will not be eligible for publication in January 2016. Step-by-step instructions for the data correction process can be found on the Quick Reference Guide: Applicable Manufacturer and GPO Record Review and Dispute Instructions http://www.cms.gov/OpenPayments/Downloads/Actions-for-Data-Correction-for-Industry.pdf. Additional information can be found on the Dispute and Correction http://www.cms.gov/OpenPayments/Program-Participants/Applicable-Manufacturers-and-GPOs/Dispute-and-Correction.html page on the Open Payments website. For assistance with other aspects of the Open Payments system, please visit the Resources page on the Open Payments website http://www.cms.gov/OpenPayments/About/Resources.html. The Open Payments system will be undergoing maintenance and will not be available between November 16 and November 23. CMS’ Enterprise Portal (EIDM) registration will continue to be available throughout this period, for reporting entities, physicians, and teaching hospitals to continue to register in the EIDM. For assistance in completing EIDM registration, visit the Resources page on the Open Payments website. Submit questions to the Help Desk via email at openpayments@cms.hhs.gov or by calling 1-855-326-8366, Monday through Friday, from 9:00 a.m. to 5:00 p.m. (ET), excluding Federal holidays. Peak Help Desk call time is between 11:00 a.m. and 2:00 p.m. (ET). "Creating Public Transparency of Industry-Physician Financial Relationships. Learn More." Centers for Medicare & Medicaid Services (CMS) has sent this update. To contact Centers for Medicare Services (CMS) go to our *Contact Us* http://cms.gov/About-CMS/Agency-Information/ContactCMS/index.html page. You're getting this message because you subscribed to get email updates from the Centers for Medicare & Medicaid Services (CMS) http://www.cms.gov/. Update your subscriptions, modify your password or email address, or stop subscriptions at any time on your Subscriber Preferences Page https://public-dc2.govdelivery.com/accounts/USCMS/subscriber/new?preferences=true . You will need to use your email address to log in. If you have questions or problems with the subscription service, please contact subscriberhelp.govdelivery.com https://subscriberhelp.govdelivery.com/ . This service is provided to you at no charge by Centers for Medicare & Medicaid Services (CMS) http://www.cms.gov . The global shift toward disclosing payments made to physicians is maturing and becoming increasingly global in nature, according to the findings of an annual survey conducted by IMS Health. The US is the leader when it comes to requiring pharmaceutical and medical-device manufacturers to disclose payments and other so-called transfers of value they make to physicians and certain other healthcare providers, like teaching hospitals. On September 28, 2015, the Centers for Medicare & Medicaid Services (“CMS”) issued a request for information (“RFI”) seeking comments on two key components of the physician payment reform provisions included in the Medicare Access and CHIP Reauthorization Act of 2015 (“MACRA”), the law enacted on April 16, 2015, repealing the sustainable growth rate formula used to update payment rates under the Medicare Physician Fee Schedule. The RFI was originally open for a 30-comment period. However, CMS has announced that it is extending the comment period for an additional 15 days. Comments to the RFI are now due to CMS on November 17, 2015. U.S. Sen. Richard Blumenthal, D-Conn., and U.S. Sen. Chuck Grassley, R-Iowa, have introduced legislation that would require drug companies and medical device manufacturers to start reporting their payments to nurse practitioners and physician assistants, as they do for physicians. On Wednesday, Sens. Charles Grassley (R-Iowa) and Richard Blumenthal (D-Conn.) introduced a bill (S 2153) that would expand the types of providers whose payments from drugmakers and medical device manufactures must be reported to CMS' open payment website, ProPublica reports (Ornstein, ProPublica, 10/8). On September 10-11, 2015, MedPAC held a meeting to discuss several issues related to the Medicare program, including (1) improving the Open Payments program, which makes public the payments from drug and device manufacturers to physicians and teaching hospitals, (2) developing a unified payment system for post-acute care, (3) the growth in stand-alone emergency department facilities, (4) Medicare payment for drugs, (5) patient encounters in Part B fee for service (FFS) versus Medicare Advantage (MA), and (6) patient characteristics that may affect MA plan star ratings for Special Needs Plans. The Commission discussed several recommendations related to these issues, such as a proposal to require each physician to disclose directly to patients any financial ties with manufacturers of products that the physician prescribes to the patient. Patients desperate for medical breakthroughs should never have to sacrifice safety in the name of innovation, but legislation underway in Congress could do just that. Earlier this summer, the House of Representatives passed a medical innovation bill known as the “21st Century Cures Act”—or simply “Cures”—that has several key provisions that would significantly weaken consumer health protections and could lead to patients being exposed to potentially unsafe or ineffective drugs and medical devices. Is The Sunshine Act Reducing Clinical Research Spending? But now a study has shown research spending may be down as a result of the act. The August issue of Life Science Compliance Update, published by Policy & Medicine, notes an analysis conducted on the U.S. government’s Open Payments database shows U.S.-based clinical research has fallen by 32 percent in a year-over-year comparison, the first since Open Payments data started being collected. The research payments were made to physicians, teaching hospitals, and non-covered recipients. Paying doctors to favor your medicine over another might be undesirable. Paying them for their efforts to assist with the facilitation of research studies is a different situation altogether. Do Data Transparency, Open Payments Reduce Clinical Research? Open Payments under the Sunshine Act have made major strides in increasing healthcare transparency, but could there be a dark side to data transparency and reporting? A recent article in a Policy & Medicine newsletter says that could be possible, as the transparency may be leading to a decrease in clinical research, according to a press release. WASHINGTON, Aug. 18, 2015 /PRNewswire/ -- Could the Sunshine Act be creating an unintentional downward trend in clinical research? An analysis of the U.S. government's Open Payments database shows that industry spending on U.S-based clinical research has dropped 32 percent in the first year-over-year comparison since Open Payments data started to be collected. The results are published in the August issue of Life Science Compliance Update, a monthly newsletter published by Policy & Medicine. It's not always clear which doctors have ownership interests in both physician-owned distributorships and the hospitals to which they sell devices, according to HHS' Office of Inspector General. The OIG found one doctor who had ownership interests in both a hospital and a POD that sold spinal devices to the hospital, as part of an analysis of 12 physician-owned hospitals that reported buying spinal devices from PODs. WASHINGTON — Fancy steak dinners, junkets at lush resorts, and cushy speaking gigs to promote new drugs have been on the wane since lawmakers forced drug companies to disclose most of the ways they steered lucrative perks and consulting fees to doctors. But critics say the stream of drug money to top physicians has flourished on a route that remains largely hidden: the continuing education programs that doctors must attend to keep their licenses. Federal law allows pharmaceutical and medical device companies to funnel millions of dollars a year, without disclosure, to doctors who teach continuing education programs. The conduits for the money are independent companies that sponsor medical lectures for doctors. Since 2011, drug industry payments to these outside companies have risen 25 percent, to $311 million in 2014, according to a Boston Globe analysis. Many physicians' pay has not yet been linked to quality of care, according to a study published Monday in the Annals of Family Medicine, the Washington Post's "Wonkblog" reports. For the study, researchers surveyed 632 physician practices. The study found physician pay practices vary widely, including a combination of salary, fees for services and rewards for quality. Doctors who worked for accountable care organizations and those who worked for more traditional practices had wide variance in payment practices. A handful of physicians received big paydays from Minnesota medical device companies last year, new ?federal data show. In 2013, GlaxoSmithKline ($GSK) CEO Andrew Witty pledged to end doctor payments by 2016 as part of an effort to clean up the company's image. But so far, little has changed in that department. Last year, the British pharma giant forked over about $15 million to U.S. physicians who promoted its drugs and attended events to learn about its products, Bloomberg reports--only a small tick downward from the year prior. Thousands of doctors received meals, travel, and consulting and speaking fees, with the largest consulting payment reaching $195,000. South San Francisco-based Genentech, now a subsidiary of Roche, disclosed $295.4 million in general payments made in 2014, almost four times as much as AstraZeneca, the company with the next highest tally. Women receive less research funding from pharma than men, according to a Cleveland Clinic study of data disclosing financial relationships between industry and physicians. CMS could have chosen one or two scofflaws that failed to file and made an example of those entities by imposing the maximum CMP. Instead, CMS appears to have decided that encouraging compliance may yield better results in the long run. To that end, CMS has contacted applicable manufacturers and applicable GPOs that should have submitted data for the 2013 reporting year, but failed to do so. CMS is working with these non-reporting entities to increase their submission compliance. Since the general disclosure rule for provider-manufacturer relationships in France was enacted into law on January 1, 2012, its compliance and enforcement have been a common point of discussion for health care professionals, pharmaceutical and medical device manufacturers, and government officials, among others. As Reed Smith partner Daniel Kadar points out in "The French Sunshine Act Continues to Be a Challenge," an article published in the April 2015 edition of eHealth Law & Policy, the law is viewed by many as a work-in-progress that requires frequent clarification. Daniel attributes this to the "erratic" evolution of the law, which he also chronicles in the December 2014 eHealth Law & Policy article "Implementation of the French Sunshine Act – One Year On." Nearly one-quarter of Medicare's top-prescribing physicians received consulting fees or other financial perks from manufacturers of the drugs they prescribed in 2013, renewing nagging questions about conflicts of interest in medical decisionmaking. More than 400 physicians prescribed at least $1 million worth of drugs in the Medicare Part D drug benefit program, and 23% of them accepted some form of a non-research payment from the corresponding drugmaker in 2013, according to a Modern Healthcare analysis of the CMS' recent Part D data release and of the Open Payments database. Congress is now getting ready to pass the so-called 21st Century Cures Act. The draft bill, proposed bythe House Committee on Energy and Commerce, aims to foster medical innovation by streamlining the Food and Drug Administration's regulatory process and increasing National Institutes of Health research funding by $10 billion dollars. The draft, which has overwhelming bipartisan support, leads to many positive implications for patients, medical researchers and pharmaceutical companies. The Centers for Medicare & Medicaid Services has set a 45-day review period for physicians and teaching hospitals to evaluate the accuracy of payments attributed to them as part of the Open Payments System. Damon Davis, director of HHS' Health Data Initiative, said, "We have an obligation to make the data available to multiple audiences -- the tech savvy who want raw data that can be mashed up and do cool things with and others who want a dashboard that can allow them to contextualize data to specific areas" -- as health care is a very local topic. The CMS has extended the deadline to file 2014 payments today, March 31st to Friday April 3th. We are not sure why, but we believe this may be related to a problem with the CMS software that affected 40% of our customers. Health researchers are calling for greater disclosure of payments from drug companies to doctors in New Zealand. The CMS wants to increase outreach efforts to providers to encourage them to register and check the accuracy of information on the Open Payments website. “Most doctors don't even think it's really relevant to their practices,” Toula Bellios, a director in the CMS' Center for Program Integrity, told the Advisory Panel on Outreach and Education (APOE) on Thursday. The committee, composed of patient advocates, payers, researchers and providers, advises HHS on outreach and implementation around the agency's various programs. Would patients think twice about participating in a clinical trial if they knew the physician running the study receives some form of compensation from a drug maker? Some might. A new study finds that multiple sclerosis patients who have not participated in a clinical trial say disclosure is important enough to influence their participation in industry-sponsored clinical trials. A Chicago-area physician pled guilty to taking kickbacks for prescribing an anti-psychotic drug and settled related false claims allegations in a case that represents the kinds of relationships that are coming to light now that the Physician Payments Sunshine Act database is open for business. After years of anticipation, the U.S. government last fall launched the Open Payments database, which tracks money and other items of value that drug and device makers give physicians for consulting, speaking and research, among other things. The effort reflected growing concern that financial ties between physicians and industry may have undue influence on medical practice and research. Misspelled drug names, mixed up payments, and more continue to plague CMS’ Open Payments Website. In August, CMS’ Open Payments suffered from a glitch that shut down the entire website. Access to the online records was suspended after doctors of the same name noticed they were credited with payments made to the other. Shortly after, CMS announced that one third of records would be withheld at the time of the Open Payments launch. “CMS takes data integrity very seriously and took swift action after a physician reported a problem,” said the agency. Amid much anticipation and after a lengthy delay, the government in September unveiled its Open Payments database, saying it would bring transparency to relationships between physicians and the drug and medical device industries. But this openness has been clouded by numerous errors that detract from its usefulness. The database mistakes surfaced as we developed an app, rolled out this month with The Upshot, to identify the drugs and medical devices that were most heavily promoted to doctors in the last five months of 2013, the period covered by the data. We found that many of the drugs with the highest spending weren't cures or even medical breakthroughs, but rather "me-too" drugs that were little different than other drugs on the market. On October 31, the Centers for Medicare and Medicaid Services (CMS) issued the 2015 Physician Fee Schedule, which includes changes to the Final Rule that implements the Physician Payments Sunshine Act (the Sunshine Act). In an effort to create “consistent reporting requirements for all continuing education events” and to eliminate the unintended consequence of the apparent endorsement of certain organizations sponsoring such events, CMS chose to remove the language in 42 CFR § 403.904(g) in its entirety. The Ontario New Democrats say they plan to introduce legislation in the New Year that would make physician OHIP billings public. “It would give us an opportunity to keep an eye on $11 billion worth of taxpayer money,” NDP health critic France Gelinas said. Physician payments amount to $11 billion annually in Ontario. Of that, about $8 billion goes to doctors in fee-for-service payments from the Ontario Health Insurance Plan. “It’s completely opaque. No one really knows where the money goes,” said Gelinas, who plans to introduce a private members’ bill after the legislature resumes sitting in February. The United States government is finally requiring drug and device manufacturers to disclose the payments they make to doctors and teaching hospitals. For decades these payments were largely hidden, until Senator Charles Grassley took an interest. As Grassley’s lead investigator on this issue, I spent from 2007 to 2010 uncovering industry money that academic researchers were hiding from their universities. And now the Physician Payments Sunshine Act is law, as part of the Affordable Care Act of 2010. Since then, progress has been made, but much more is needed. On October 31, 2014, the Centers for Medicare & Medicaid Services (CMS) issued its final Medicare physician fee schedule rule for CY 2015 (the Final Rule), which also includes certain changes to the Sunshine Regulations. Notably, CMS finalized its proposal to eliminate a reporting exclusion that applies to certain payments or other transfers of value made by a manufacturer or group purchasing organization (Applicable Manufacturer or Applicable GPO, respectively) to a speaker at a CME program (the CME Exclusion). Open Payments is a congressionally mandated, national disclosure program that promotes transparency and accountability in health care. But what does “transparency” mean to you as a patient, and why is it important? The program gives you the opportunity to know if your doctors have a financial relationship with companies that make or supply medications, medical supplies or devices, and the biological products used in your care. The bottom line is that knowing about these relationships will let you be a more involved and informed health care consumer. Does the Open Payments Database ‘Distort’ What Docs Get For Research? Another day and another complaint is being lodged about the Open Payments database. The database, you may recall, will be launched today and reveal how much money doctors receive from drug and device makers. Created under the Sunshine Act provision of the Affordable Care Act, the database aims to mitigate concerns that industry payments to doctors may unduly influence medical practice and research. The so-called Open Payments program is intended to shine a light on potential ethical conflicts and allow patients to look up their doctors online. The first batch of data, however, will be incomplete, covering only a few months at the end of 2013. Journalism website ProPublica says it has tracked 3.4 million payments to health professionals since 2009, totaling more than $4 billion. The government had to take offline its system for doctors to verify payments from drug companies after at least one doctor had payments attributed to him that actually went to someone else. The Centers for Medicare & Medicaid Services, in what amounts to a sudden about face, wants to delete the Sunshine rule's exclusion for continuing medical education. The elimination of the exemption, a U-turn after earlier granting such payments a carve-out, was among several intended changes to the Open Payments program included in the proposed Physician Fee Schedule for Calendar Year 2015. Today the Centers for Medicare & Medicaid Services (CMS) issued an advance copy of the CY 2015 Medicare Physician Fee Schedule (PFS) proposed rule, which includes certain changes to the regulations implementing the Physician Payment Sunshine Act, also known as the Open Payments program. These proposed changes come just three days after the inaugural deadline for applicable manufacturers and group purchasing organizations (GPOs) to report to CMS detailed information regarding payments and transfers of value made to physicians and teaching hospitals, as well as physician ownership information. A CMS rule that exempts drug and medical-device companies from having to disclose indirect payments to physicians for accredited continuing medical education could prompt manufacturers to shift marketing dollars toward CME and away from direct promotional programs, experts say. New rules introduced in the US to make the financial relationships between pharma companies and physicians more transparent are themselves lacking in clarity, it would appear. In February 2013, the Centers for Medicare and Medicaid Services (CMS) published its final rule requiring manufacturers of medicines and medical devices to report payments exceeding $10 or other 'transfers of value' (TOV) made to physicians and teaching hospitals, as well as physician ownership and investment interests. With the June 30 deadline for Phase 2 Sunshine Act reports by pharmaceutical and medical device manufacturers ("Applicable Manufacturers") and group purchasing organizations ("GPOs') quickly approaching, the Centers for Medicare and Medicaid Services ("CMS") has issued additional guidance on Phase 2 reports. As is well known, the Sunshine Act (the "Act") requires Applicable Manufacturers and GPOs to report certain financial relationships with physicians and teaching hospitals. The new guidance includes both technical guidance for preparing and uploading data submissions and an updated User Guide. In sum, the release of Sunshine Act and Medicare billing data is likely to increase Government investigations and generally benefit qui tam plaintiffs. Thus, in anticipation of the release of Sunshine Act data in September 2014 and given the release of Medicare billing data for 2012—which could continue in future years—now is a good time for prudent health care professionals to go back and review compensation arrangements and billing records to ensure that there are no surprises. Will We See Fewer Kickback Settlements With Rise of ACOs, Sunshine Act? Just over a week ago, the Department of Justice announced that Medtronic had agreed to pay $9.9 million to settle accusations that the company had improperly paid physicians to get them to use more of its pacemakers and defibrillators. •6% of respondents failed to validate their data. While Medicare billing data has always been available to the Government, Sunshine Act data has not been previously available on this scale. According to CMS, compliance with the Act's reporting requirements does not preclude liability under statutes such as the Anti-kickback Act (41 U.S.C. §51 et seq.). Federal and state prosecutors have already indicated that Sunshine Act reports are a potential source of data for new False Claims Act (FCA) investigations. Moreover, the data could support an inference of off-label marketing if, for example, a pharmaceutical manufacturer makes payments to physicians in unexpected specialties. The Centers for Medicare & Medicaid Services (CMS) is providing this guidance document as informational material on Open Payments. A high level of uncertainty around collected and submitted data characterized the first phase of mandated Federal Open Payments reporting by life sciences companies with over 20% saying reports initially filed were rejected before being accepted upon resubmission, according to a new survey of senior life sciences compliance, regulatory and legal officers. The majority of attention regarding the Affordable Care Act has been focused on health insurance issues, but other parts of the healthcare reform law will also impact the relationship between the federal government and physicians. Over the weekend, registration for doctors and teaching hospital representatives opened in CMS's Enterprise Portal, the entryway to CMS's Enterprise Management System. It's the first step physicians must take if they want to review the information submitted about them by manufacturers and group purchasing organizations regarding financial interactions they had with them in the last five months of 2013 and, if necessary, dispute that information. 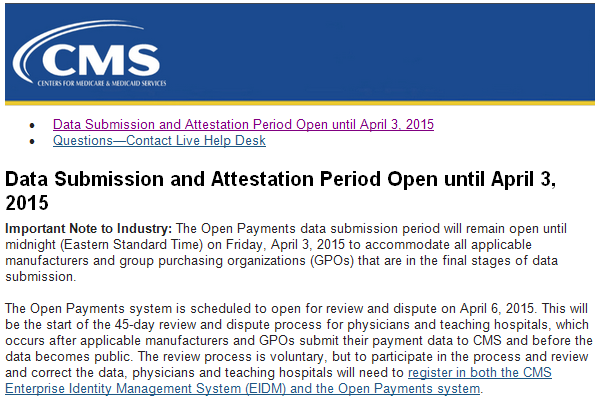 Step two—registration in CMS's Open Payments system—is set to begin in early July. Pharmaceutical and medical device manufacturer payments to physicians and teaching hospitals are on the verge of being publicly available under the Physician Payments Sunshine Act, which could change the dynamics of fraud enforcement, the management of conflicts of interest and the public perception of physicians and hospitals. Law360, New York (May 22, 2014, 5:09 PM ET) -- In the words of the former U.S. Supreme Court Justice Louis D. Brandeis, sunshine may well be the best disinfectant, but different countries have very different ideas on where health care industry transparency is needed. In the U.S., intense scrutiny in recent years has focused on relationships between drug and medical device manufacturers on one hand and physicians and teaching hospitals on the other. New requirements by the Centers for Medicare & Medicaid Services, effective this year, will require public disclosure of these relationships. By now, you may have heard about the Open Payments program (previously known as the Sunshine Act) and wondered what it is and what it means for you. This program offers patients the opportunity to know if their doctors have a financial relationship with companies that make or supply medicines, medical supplies or devices, and the biological products used in their care. Disclosure of these relationships will allow patients to be more informed health care consumers. Most people know less about their doctor than they do about their local barista or bartender. The world of medicine—from the pediatrician checking your child’s breathing to the specialist researcher toiling away at a university lab—is guardedly private, hidden behind spotless white coats and inscrutable clipboards. But that’s about to change. Under the Physician Payments Sunshine Act, pharmaceutical and medical device manufacturers and group purchasing organizations (GPOs) are required to annually report payments or other transfers of value made to physicians and teaching hospitals. The resulting data will be available on a public, searchable website entitled Open Payments. CMS is inviting comments on the Physician Payment Sunshine Act "Open Payments Program" dispute resolution and corrections process. As previously reported, the Physician Payment Sunshine Act requires pharmaceutical and medical device manufacturers and group purchasing organizations (GPOs) to register with and submit to CMS data on their financial relationships with physicians and teaching hospitals. Are Grey Areas In The Sunshine Act Leaving Manufacturers in A Fog? While some areas of the U.S. Sunshine law are “clear as daylight”, after a glance, and then a nice, long, hard stare, other areas of the law may leave manufacturers wandering in the dark. Through organizing teleconferences and issuing FAQs and updates, the Center for Medicare & Medicaid Services (CMS) has attempted to narrow the gaps between the law and real-life practices, but even with the combination of the statute, final regulation and its preamble, and CMS guidance (collectively, what we can term the “solid ground”), significant areas of vagueness remain, including the identification of teaching hospitals and whether to report certain indirect payments. On Monday, May 5, 2014, CMS published in the Federal Register an unexpected notice seeking additional public comment specifically around the Dispute Resolution process, which is the process CMS is establishing to give physicians who receive payments from pharmaceutical or medical device manufacturers an optional way to review, and if necessary to dispute, the payment information submitted to CMS by the manufacturers before the information is published. Comments are due to CMS by June 2, 2014. Also on Monday, CMS announced that physicians and teaching hospitals will be able to register as an Open Payments system user starting on June 1, 2014. Once registered, physicians will be able to access and review their own data beginning on a date in July that CMS will announce later. Beginning in September 2014, the Centers for Medicare and Medicaid Services (“CMS”) will publish a list of all payments and transfers of value paid by drug manufacturers to physicians and teaching hospitals on a publicly accessible website, pursuant to the Physician Payments Sunshine Act (Sunshine Act). The Sunshine Act, a provision of the Affordable Care Act, is intended to create greater transparency around the financial relationships of manufacturers, physicians, and teaching hospitals. Digging deeper into doctor's inner dialogues, Medscape polled just over 24,000 physicians across 25 disciplines to get a better sense of how they feel about their role in the healthcare field, if they feel they are appropriately compensated, and what their daily routine looks like. Unsurprisingly, the day-to-day questions had the most straightforward answers: they see a lot of patients and spend little time—maybe 16 minutes—with each one. The number of US companies facing regulatory proceedings increased for the third consecutive year, according to Norton Rose Fulbright’s Annual Litigation Trends Survey. The upward trend is the result of a stricter regulatory environment and increased scrutiny from a broad range of state and federal agencies. Close to 20 percent of survey respondents said their companies had faced a regulatory/investigation matter in 2013, up from 9 percent in 2012. The increase was consistent among all industries and companies of varying sizes, but was most pronounced among technology/communications organizations (27 percent versus 10 percent in 2012). Will Physician Payment Sunshine Act Data Usher In A New Era Of False Claims Act Litigation? While attention has been focused on Medicare physician payment data released by CMS yesterday, upcoming Sunshine Act data will shine a new spotlight on financial relationships between physicians and pharmaceutical and medical device companies – with potential FCA implications. Last week marked the deadline for pharmaceutical and medical device manufacturers and group purchasing organizations (GPOs) to register with and submit aggregate 2013 payment and investment interest data to the Centers for Medicare & Medicaid Services (CMS) on certain financial relationships between themselves and physicians and teaching hospitals, as required by the Physician Payment Sunshine Act.1 In May, manufacturers and GPOs will be required to submit to CMS detailed 2013 payment data. 2013 was a year of unprecedented scrutiny of financial relationships between manufacturers and health care professionals, such as physicians. Both the United States and France imposed sweeping new reporting and disclosure requirements in an effort to provide transparency and, theoretically, to enable the public – including patients – to make informed treatment decisions and assess possible conflicts of interest. Both sets of requirements carry potentially large financial penalties for failure to report and for incorrect reporting. For manufacturers operating globally, compliance with these provisions will be an ongoing challenge. Doctors haven't disengaged from drug companies in the months since the tracking of financial relationships between them started, several pharmaceutical executives here said. The Physician Payments Sunshine Act required drug companies to track gifts and other payments to physicians starting August 1, making them public later this year -- leading to fears that public shame or misunderstanding might come of doctors' relationship to pharma. A delay in the launch of the Centers for Medicare & Medicaid Services (CMS) web site that tracks the financial relationship between physician and industry may prevent physicians from fully reviewing the data. Website delays may curtail physicians’ ability to review data on payments they received from drug and device makers before the federal government publishes it Sept. 30. "There is a compelling need to ensure that physicians have an adequate amount of time to register with the Open Payments Program system, to review their consolidated reports, to dispute errors, and obtain corrections," Dr. James L. Madara, AMA executive vice president, wrote in a letter to the Centers for Medicare & Medicaid Services. Ever since The Centers for Medicare & Medicaid Services, or CMS, issued its final guidelines in February 2013 for how life sciences companies need to comply with the U.S. Sunshine Act provision of the Patient Protection and Affordable Care Act governing payments and transfers of value to healthcare providers and healthcare organizations, drug and medical device manufacturers have had all hands on deck to ensure they collect the pertinent data in order to meet the first aggregate spend reporting deadline. Healthcare professionals (HCPs) working in the UK received a total of £38.5m from pharma companies, according to figures published by the country's trade body. The Association of the British Pharmaceutical Industry (ABPI) calculated the aggregate figure based on data from 34 of the top 40 pharma companies for UK sales and said it had published the result as part of a greater commitment towards industry transparency. RESEARCH TRIANGLE PARK, N.C. — Drug companies of all sizes have implemented compensation limits — or spending caps — to ensure they remain compliant with new Sunshine Act guidelines regulating payments to physicians. The average annual spending limit, according to Cutting Edge Information, is $58,000. Ours can be an overly polite country. If the recent Senate spending scandal taught us anything, it’s the value of openness in financial relations. Our American neighbors have come to understand this (somewhat), and now believe that such transparency should not be confined to Congressmen or Wall Street. WASHINGTON – Mark DuVal’s law firm has been busy teaching medical device and drug makers how to obey the Physician Payments Sunshine Act. It is no easy task, says DuVal, a Minneapolis attorney who used to work for Medtronic Inc. and 3M Co.
With the Open Payments System rollout, came the phased approach for data submission, requiring aggregate data in Phase 1 and detailed data reporting in Phase 2. The Centers for Medicare and Medicaid Services (CMS) recently announced that its Open Payments System is now open for registration and data submission. The system was created to receive data submissions from Applicable Manufacturers and Applicable Group Purchasing Organizations (GPOs) as required under Section 6002 of the Patient Protection and Affordable Care Act (popularly known as the U.S. Sunshine Act). With this announcement came the new concept of a two-phased approach. Some of the nation’s largest pharmaceutical companies have slashed payments to health professionals for promotional speeches amid heightened public scrutiny of such spending, a new ProPublica analysis shows. For decades, it’s been no secret that some physicians have financial relationships with health care manufacturing companies. For example, a pharmaceutical firm might fund a cardiologist at an academic medical center to research an experimental medication for lowering cholesterol. Or, an orthopedic surgeon might receive a consulting fee from a medical device manufacturer for counsel about an artificial hip. Companies in the United States and United Kingdom dealt with more litigation while regulatory investigations reached a five-year high, according to Fulbright's 9th Annual Litigation Trends Survey. After a one-year decline, litigation rose to 2010 levels as businesses on both sides of the Atlantic initiated and faced more lawsuits in 2012 than they did in 2011. In the U.S., labor and employment disputes and contract litigation led the way. The editorial "Is your doctor on a drugmaker's payroll?" tells an incomplete story that misleads the public and discourages collaborations that improve patient care and medicines. With recent clarification from CMS that medical textbooks and journals must be reported as payments/transfers of value made to physicians, Partners for Healthy Dialogues is taking a look at all of the items that will be reported about physicians and teaching hospitals. Drug and Device companies that constitute "applicable manufacturers" under the Sunshine Act and its enabling regulations will need to submit detailed information on "payments" to physicians or teaching hospitals on March 31, 2014 to the federal Center for Medicare and Medicaid Services ("CMS"). As of August 1, 2013, firms were required to track payments – and other ways in which value is conferred on physicians and teaching hospitals – in order to include them in the filings due with CMS on March 31, 2014. Partners for Healthy Dialogues partner Christopher White (general counsel, AdvaMed) recently sat down with Diane Biagianti, vice president, chief responsibility officer, Edwards Lifesciences, to talk about the importance of collaboration between physicians and medical technology companies, and implementing the Physician Payments Sunshine Act. Last week, the Centers for Medicare & Medicaid Services (“CMS”) clouded the process for pharmaceutical and medical device manufacturers, and group purchasing organizations (“GPOs”), to register and submit reports under the Physician Payments Sunshine Act (the “Act”). Last week, the Centers for Medicare & Medicaid Services (“CMS”) clouded the process for pharmaceutical and medical device manufacturers, and group purchasing organizations (“GPOs”), to register and submit reports under the Physician Payments Sunshine Act (the “Act”). The final rule implementing the Act (“Final Rule”) set a March 31, 2014 deadline for all data (covering August 2013 through December 2013) to be submitted to CMS through its Open Payments Program. In addition, CMS guidance provided in a previous webinar had indicated that manufacturers and GPOs covered by the Act would be able to register in “early 2014” and that registration would remain open for 90 days. The guidance, however, provided through an email announcement and on the Open Payments website, announced a delayed start of registration and explained that registration and reporting will now take place in two phases (for the first Sunshine Act reporting period only). Last Friday, CMS issued a notice announcing the opening of registration for electronic Open Payments reporting under the physician payment sunshine provisions of the Affordable Care Act. (A previous post on the sunshine provisions and our memo summarizing CMS’s final implementing rule can be found here.) According to the final rule, issued almost one year ago, applicable manufacturers and GPOs must complete their reports by March 31, 2014 for payments and transfers of value made during the August 31-December 31, 2013 timeframe. However, in today’s notice, CMS indicates that the sunshine reporting will occur in two phases, the second of which will not be completed until June or later. At CMS, we are committed to transparency. Thanks to the Affordable Care Act, we have powerful new tools to advance transparency in healthcare and provide consumers with information to help them make informed healthcare choices. The Open Payments program creates greater public transparency about the financial transactions among doctors, teaching hospitals, drug and device manufacturers, and other healthcare businesses. We’re pleased to share today the latest steps we are taking to bring accountability to healthcare as a result of Open Payments. There is still no consensus on whether medical writing or editorial services support from pharma companies should be reported under the Sunshine Act.